Temptations are plenty during the holidays, especially when the dessert comes out. The pecan pie is oozing over with maple sugared goodness, and the ladyfingers lining the tiramisu are beckoning you to indulge in its sweet mascarpone. But there are many merry ways to contribute to the dessert table without compromising the hard work you put in all year long. 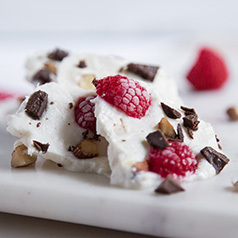 Frozen yogurt bark starts with a protein-packed Greek yogurt base and a little sweetness thanks to the maple syrup – and the rest is up to you. Better yet, it’s a fun way to get the kids in the mix, giving them an empty canvas to decorate with bright fruits, nuts, and chocolate. I use fresh raspberries, almonds, and dark chocolate. You can use any combination of fruits and nuts so feel free to get creative – pomegranate and pistachio, dried cranberries and walnut, strawberry and chocolate. If you prefer sweet over tart, try using dried fruits instead of fresh fruit. You're on the nice list and deserve a sweet reward – so let’s deck the halls and get this party started. Add the base ingredients to a bowl and stir to combine. Spread the base mixture on a parchment-lined baking sheet. Slice the raspberries. Crush the almonds with a meat mallet. Crush or slice the chocolate into chunks. Top the base mixture with the fruit, nuts, and chocolate, pushing in gently as-needed to make sure they freeze into the base. Sprinkle with any remaining chocolate shavings. Freeze for a couple of hours or overnight until hard. Break gently by hand or cut with a knife and keep frozen until ready to serve. Enjoy.